The American holiday of Thanksgiving can be a heart-warming time when families get together for a large meal and to give thanks for many things in their lives. Traditions on thanksgiving include a meal of turkey and pumpkin pie, family get-togethers, games and celebration. Many also see Thanksgiving as a kickoff to the holiday shopping season, with the day after Thanksgiving dubbed as “Black Friday” when retailers offer steep discounts on popular products. Thanksgiving wristbands can be customized to your family’s own traditions, and imprinted with a message meaningful to you. With writable wristbands, you can take the tradition of saying what your thankful for one step further. Everyone at your celebration can write what they’re thankful for on their wristband, both as a reminder that day, and in the future. Add your family’s name and the year. Use a combination of fall colors, such as segmented or swirled colors orange and yellow. Use slap bands that snap to your wrist and fit snugly in place. The kids will love them! Order thin quarter-inch or thick one-inch bracelets to really make your day special. Add custom artwork, or select clipart from our extensive library. At AmazingWristbands.com, we sell only 100% silicone made products. This ensures that they are latex free and non-allergenic. Use our online builder to create your own, or give us a call if you need help. Many of our styles have no minimums and can be delivered quickly. We offer free shipping, free artwork, free design, and free color matching. 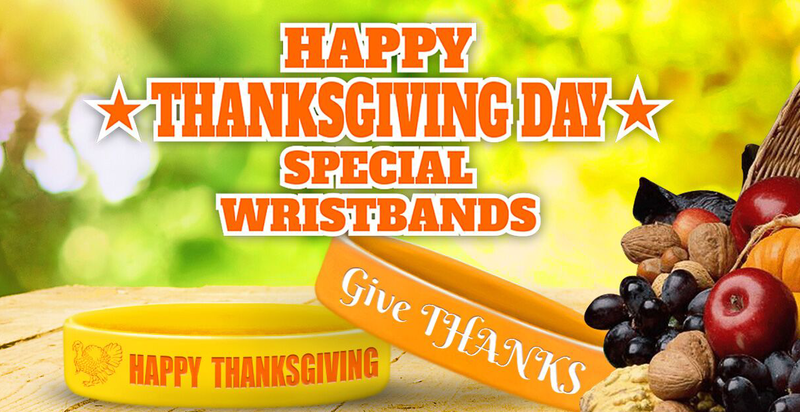 Create your Thanksgiving wristbands online today! I am wanting to get approx. 40 orange wrist bands that say Give thanks. How much would that be and how long would it take to get these? ?